It’s that time of the year again, when we’re barraged by ever increasing pressure to find that perfect, unique, wow-I-would-have-bought-this-myself gift. Gulp! 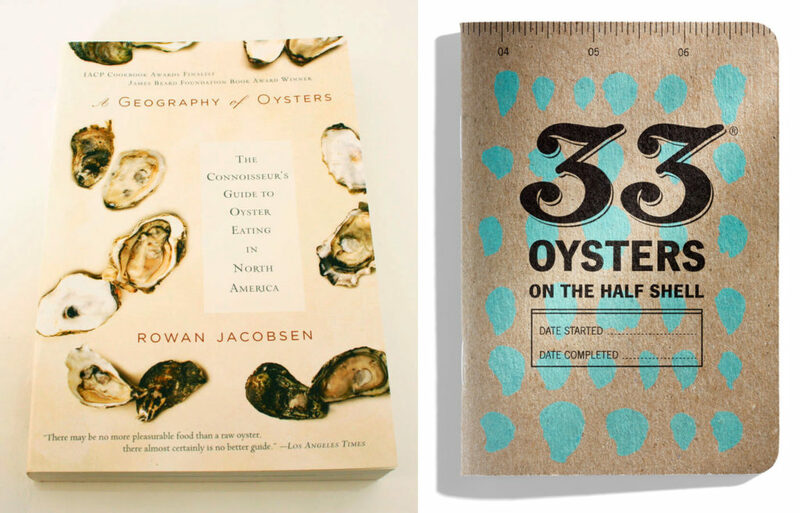 So, we’re joining the holiday listicle train this year, with what we hope is a list of surprisingly awesome oyster and ocean-themed gift ideas. Skeptical? Read on, and let us help you treat someone (or yourself) to a gift that’s sure to make a splash! A Geography of Oysters: THE definitive guide to the world of oysters, Rowan Jacobsen brings us on a journey to explore oyster merroir around the world. You’ll learn the basics of oyster farming, species, what to try at the raw bar, and everything about oysters that you didn’t know you wanted to know. A must-read for the true oyster connoisseur. 33 Oysters Tasting Journal: Love oysters but can’t keep track of which ones you like? 33 Oysters is a one-of-a-kind oyster journal that provides an easy way to quickly record your shellfish tasting notes in a small, convenient notebook format. It’s perfect for oyster novices and pros alike, and it’s designed by our friend Julie Qiu, from In A Half Shell oyster blog. Oyster Knives: This is my knife. There are many like it, but this one is mine. Oyster knives come in many shapes, sizes and colors, and it’s best to try a few out before settling on your go-to knife. From a classic 4″ rounded tip Boston knife to an ergonomic handle designed by a Canadian speed shucker, there’s a knife waiting for you! Around the office, this sharp tipped, 2.5″ speed shucker is a favorite for getting under those shells quickly. 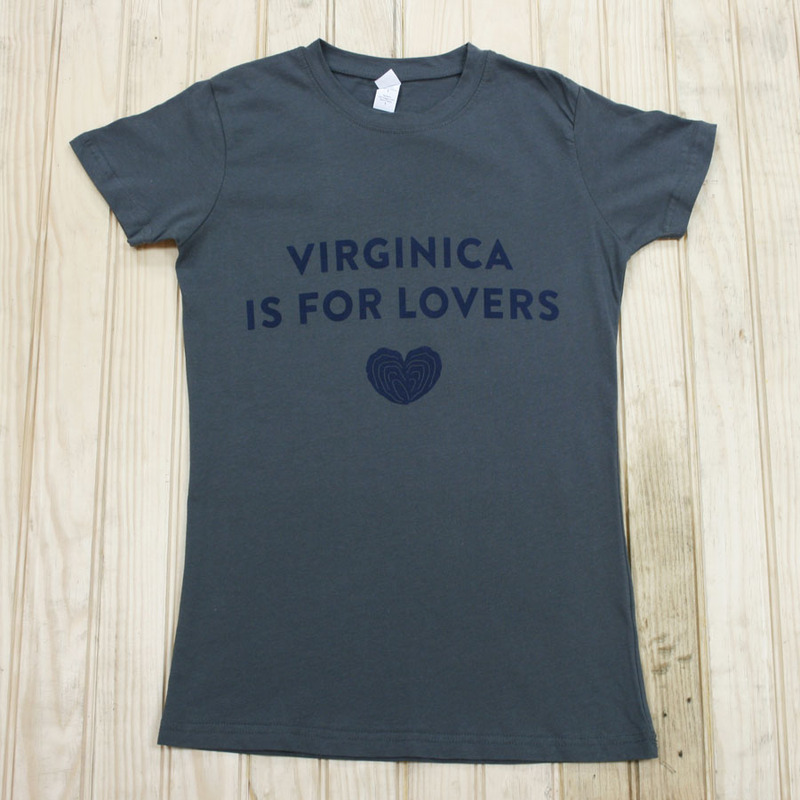 T-Shirt: Move over, Virginia oyster lovers want to have some fun too! The Eastern oyster (Crassostrea virginica) is the dominant oyster grown on the East Coast, and flourishes all the way from Southern Canada to the Gulf. Celebrate the Virginica oyster and show your appreciation for fine brine! For additional options, you can also brush up on your oyster geography with an Oyster Map shirt, or flaunt your knowledge of a 5 oyster species with a Merroir shirt. These shirts are lightweight fine knit jersey cotton tees, with contemporary fitting and tear-away tags. Charleston Oyster Tie: This bowtie is made of natural woven burlap, similar to the material used in Southern oyster sacks. It is hand-sewn with vintage ribbon and available in a wide variety of colors and sizes. Half Sheller Board: Looking for a help while shucking AND displaying oysters? The Half-Sheller Board is a revolutionary shucking board and serving tray carved from solid maple wood. The grooved center helps grip the oyster in place while you shuck it, and then oysters can be displayed in a ring around the tray’s edge. Shucking Board: While a towel is generally sufficient protection for your hand while shucking, this shucking board does the job even more elegantly. 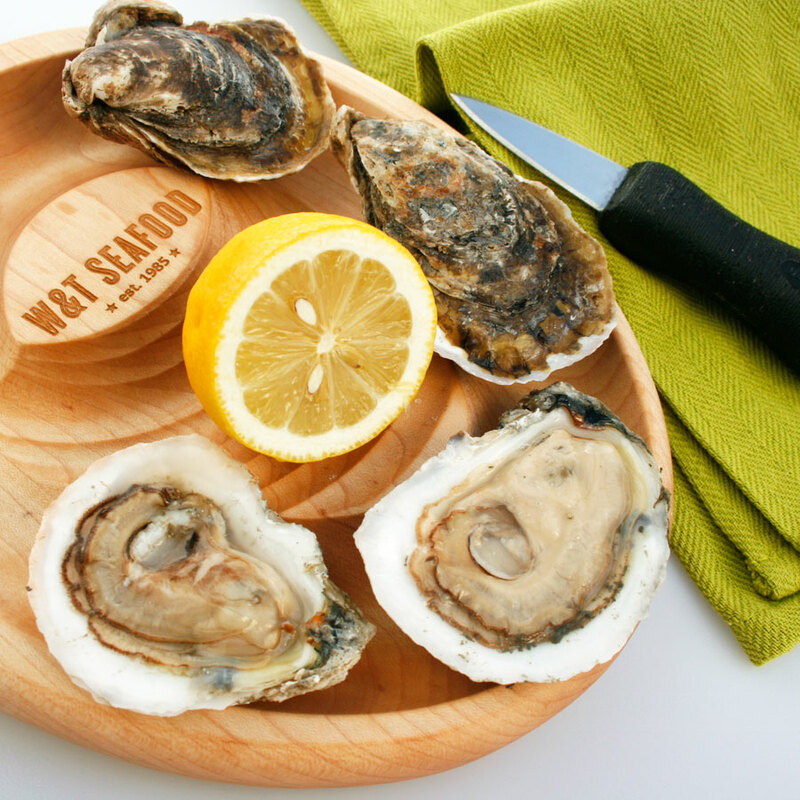 Simply slide the oyster into the “shoe,” hook the end of the board over a table edge and shuck away without fear! This sturdy wood board will last for years to come in your kitchen. 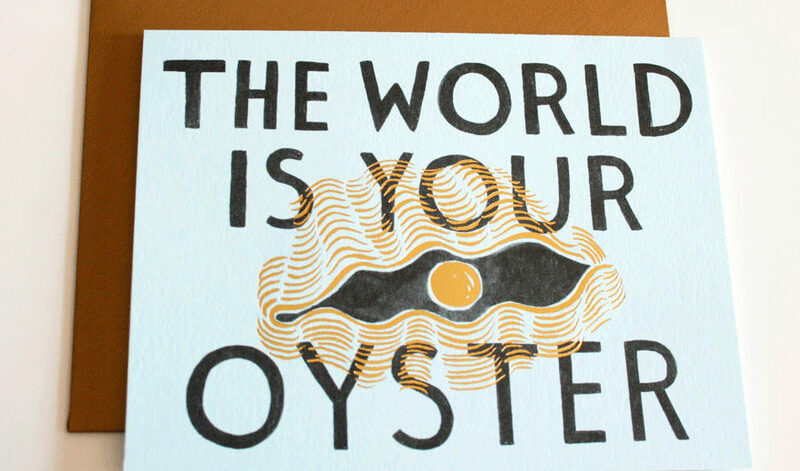 World Is Your Oyster Notecards: Send some bivalve benedictions to inspire someone today! We love the elegance of this gold foil oyster card with a blank interior and matching envelope. World Is Your Oyster Print: We could all use a reminder that we’ve Totally Got This. A fun print for your office or kitchen. 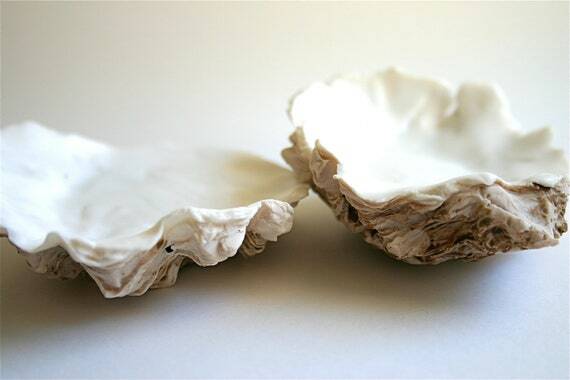 Chocolate Oyster Shells: These shells are stunningly realistic but completely edible! Each one is hand-crafted with a candy shell and 72% dark chocolate on the inside. Oyster Grill Rack: We’re partial to raw oysters, but definitely won’t say no to grilled oysters with a drizzle of Tabasco and butter. Or parmesan and bacon. 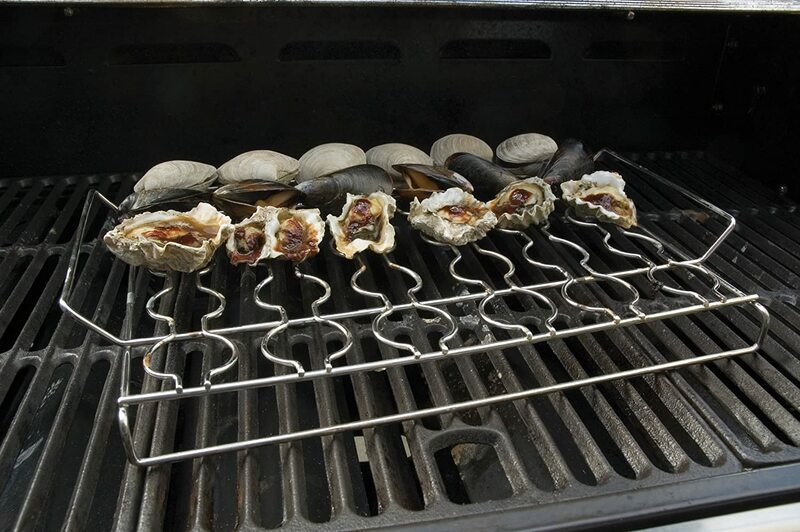 Use this rack to keep your oysters level, with no spilled oyster liquor as you transport them. You can even use the rack for items like grilled artichokes or mushrooms. 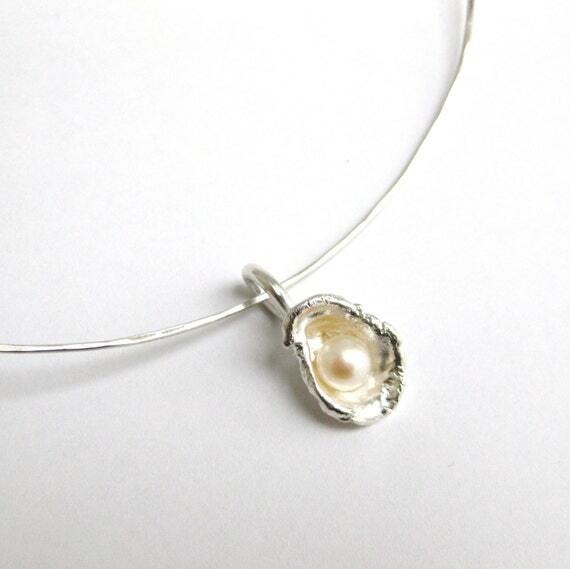 Oyster Necklace: We love this simple yet elegant silver necklace with an oyster and pearl pendant! Along the same lines, these oyster-shaped earrings also made us smile and would make a great stocking stuffer. Modernist Oyster Paintings: Oysters in Flight? What does it really mean to have a charbroiled oyster? Go on a fanciful journey with these oyster-themed paintings by Carlos Lopez, who reminds us that the oyster is beautiful in nature and in our dreams. Oyster Treasure Box: This oyster box with an antique bronze finish comes complete with freshwater pearls inside. Keep something special inside, or display it on your coffee table. 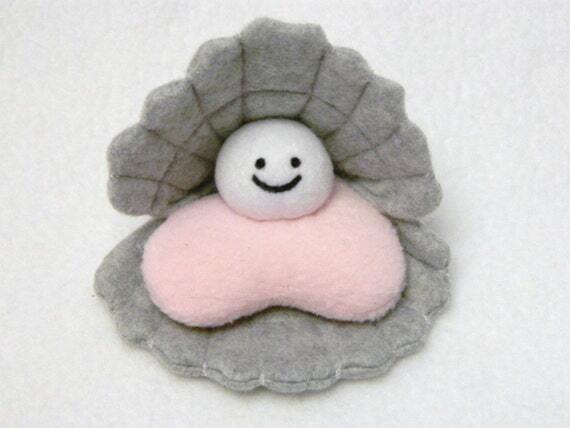 Plush Oyster: This handmade fleece oyster toy comes with a smiling pearl, and overwhelms our cute overload synapses. The perfect mollusk for rounding out your stuffed animal collection. Seashore Field Guide: What did I just pick up on the beach? What’s in that shell? This field guide gives introductory information on seashells, crabs, starfish and more. Great for the aspiring naturalist and suitable for ages 7 to 77. 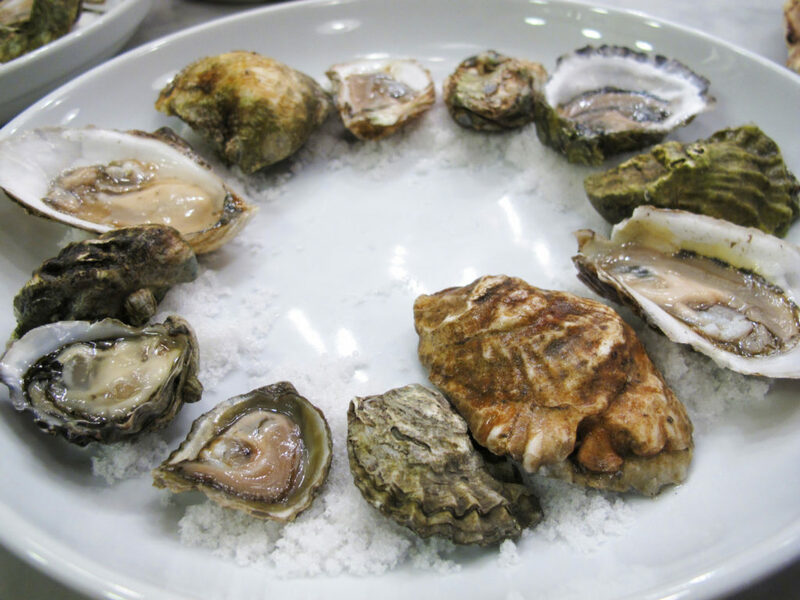 Private Oyster Workshop: Ready to take your oyster knowledge to the next level? Eager to demonstrate your shucking finesse at your next cocktail party? We offer private oyster classes in the comfort of your own kitchen or workspace. This is also a fantastic corporate team building exercise for any companies looking to expand their food and beverage knowledge. Your interactive workshop can be tailored to meet your interests, and our standard package includes a comprehensive Oysters 101 presentation, a tasting of East and West Coast oysters, hands-on shucking lessons, and an oyster knife to take away for your future oyster parties. This is a great opportunity to take your oyster knowledge to a new level in an intimate setting, or a perfect gift for the oyster connoisseur in your life! Gift Certificates: Can’t decide what they’d want? Take the guesswork out and simply give them a Element Seafood gift certificate! We’re offering gift vouchers for any product on our website; note that live shellfish must be picked up on-site, but merchandise can be shipped.